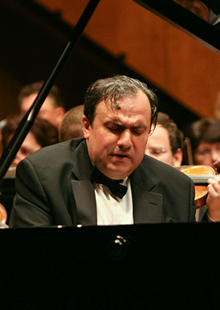 Born in Tashkent, Israeli-American pianist Yefim Bronfman has performed in the world's greatest halls and with its brightest musical luminaries. Recognized around the globe as one of the greatest pianists of our time, this “fabulous, fearsome” (Seattle Times) performer is admired by both audiences and critics alike for his “digital dexterity, warmly romantic sentiment, and jaw-dropping bravura” (Chicago Tribune). Over his decades-long career, Bronfman has earned an Avery Fisher Prize, seven Grammy nominations, and a Grammy award. Especially known for his “sparkling” (The New York Times) performances of Beethoven, he presents a recital in Santa Fe entirely dedicated to the iconic composer.